A parklet is a small space serving as an extension of the sidewalk to provide amenities and green space for people using the street. It is typically the size of several parking spaces. Parklets typically extend out from the sidewalk at the level of the sidewalk to the width of the adjacent parking space, though some have been built at the level of the street with access from the sidewalk. Parklets are intended for people. 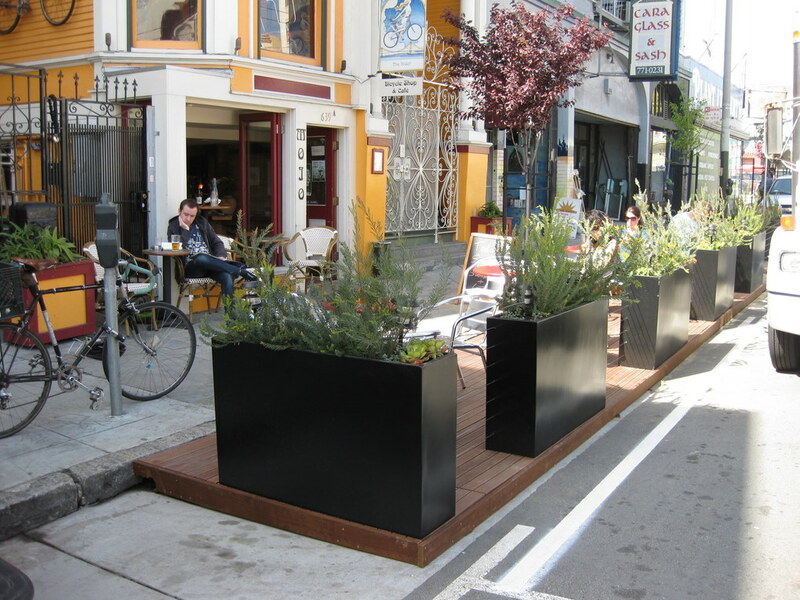 Parklets offer a place to stop, to sit, and to rest while taking in the activities of the street. In instances where a parklet is not intended to accommodate people, it may provide greenery, art, or some other visual amenity. A parklet may accommodate bicycle parking within it, or bicycle parking may be associated with it. 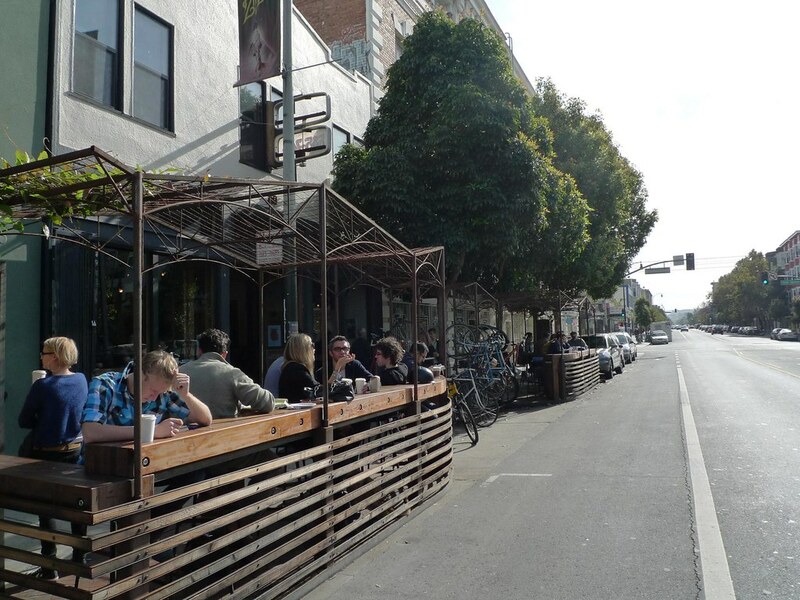 If you look at the photos in this post, you’ll see some examples of parklets in other cities. 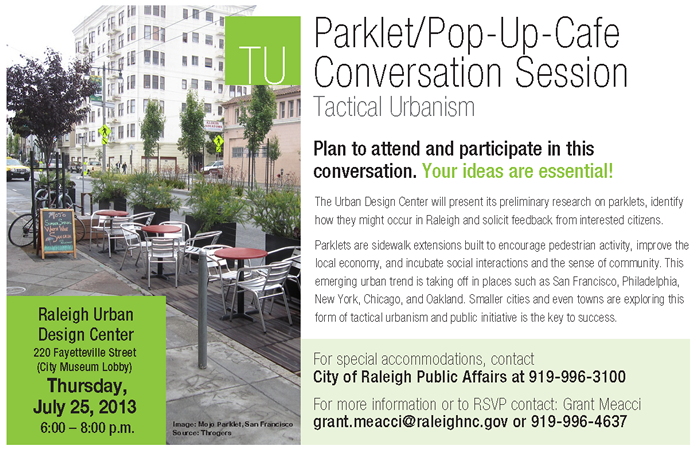 According to the flyer for the event, attached at the bottom, the folks at the UDC will be presenting their preliminary research and want to get your feedback about parklets in Raleigh. A big positive to having parklets is that it adds more space for pedestrians to sit and linger. Already an area with very low parkspace per citizen, downtown Raleigh doesn’t have room to add more parks in the traditional way so parklets, in combination with other more urban tactics, could be the solution. There’s also an economic activity advantage because the shops and restaurants in downtown thrive with an active sidewalk life. One negative is that public street space, more specifically on-street parking spaces, have to be given up for these parklets. While that might make public officials wary of parklets, citing concerns about loss of revenue, I question the reality of it. Does a few less on-street spaces really result in a loss of revenue? In my opinion, I would think that it doesn’t matter since downtown currently has a gross oversupply of parking spaces in the decks. Hopefully the UDC has some thoughts on this and how other cities have addressed this fear. Date/Time: Thurs., July 25 from 6 p.m. to 8 p.m.
Well. They are pretty but this would mean less parking. There are 40,000 parking spaces downtown. losing a couple on the street will hardly be an issue. the idiots that drive on the other hand may be.. Right on Thomas… actually, i think a couple dozen spaces shouldn’t be an issue. A few lost random spaces on the street won’t deter people; if so, a car parked there would be a just as much a deterrent. It might mean less parking for cars, but it would mean more parking for people. I also think that a couple of parklets on spaces that aren’t parking spaces (e.g. that Crepe Myrtle in between the two driveways at Moore Square Station parking garage) should be considered; maybe not a full parklet, but at least a small bulb-out would be appropriate. Not only would that give the appearance of wider sidewalks, but it would set the boundary for drivers which otherwise have free-range and more “room for error” where there are no parked cars setting that boundary for them; making it safer for pedestrians and cyclists. Imagine if parklets boxed in that crosswalk near the aforementioned spot (or any of the many mid-block crosswalks throughout DT)… drivers would have no option but to slow down a bit or at least pay a bit more attention when approaching these areas, making for a much more pleasant and enjoyable pedestrian/cycling experience. One “problem” with borrowing (should be permanently IMO) parking spaces is that if the perception of “difficulty finding parking” or “expensive parking” becomes the norm, the burden of proof goes back to DT in general to prove to people that this isn’t the case and even if it is, the experience is well worth the trouble and/or cost. Love this idea! I can see some design review may be needed, bu what a great idea for downtown. Sorry, I can’t make the meeting. Well I can tell you where the first one needs to go: Raleigh Times + Morning Times. That block is PACKED with people almost every night (which is awesome), and could desperately use some more outdoor seating room.